First day in awhile with no rain....sweet. East wind....challenging. We started out the day with a bang, we caught about 30 fish in the first hour of daylight. About 7 a slight wind got up out of the East which caught my attention. I do not like fishing in an East wind. East wind is a wind that is pre-frontal usually right before a cold front hits. Stripers don't like much change. Four days of rain or four days of sun is OK but before a front when the barometer starts to drop Stripers tend to not be aggressive. 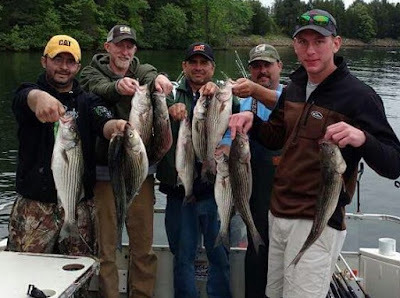 We kept seeing the Stripers but instead of constant fish on like the first hour we were only taking hits every 5 minutes or so then as the day progressed it got worse. Don't take me wrong, catching 85 Stripers today was great but the decent Stripers don't feed well and they let the punks eat in adverse conditions. DP had a similar experience and his catch ratio declined as the morning wore on. All is good though, everyone caught plenty of fish, everyone had plenty of laughs and everyone did not have to work today. DP's crew caught 35 this morning.